San Bernardino shooters were "radicalized" for "a long time." The Times Says the San Bernardino Shooters Were “Radicalized.’ What Does That Mean? 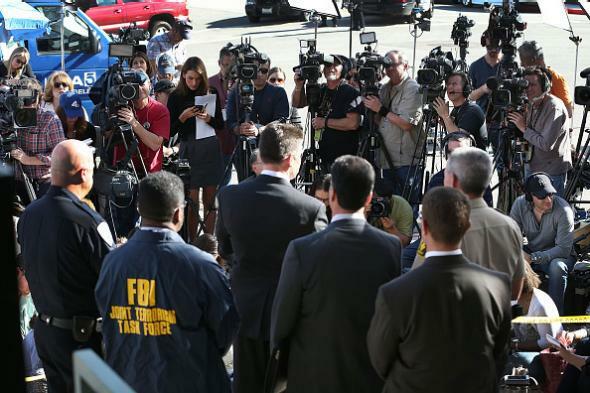 Law enforcement officials brief members of the press today in San Bernardino. At about 3:30 p.m. the New York Times posted a breaking news alert on its website announcing that San Bernardino killers Syed Farook and Tashfeen Malik had been “radicalized.” Now, the term “radicalized” is a vague, inelegant one that in this usage seems to imply that there is some identifiable binary difference, observable in retrospect, between being a normal person and being a murderer. It also seems to be used largely in reference to Muslim terror groups even though right-wing white and Christian extremists can be just as dangerous. But maybe the article itself explained the news in more comprehensible terms? Both the assailants in the deadly attack in San Bernardino, Calif., that killed 14 people last week had been radicalized for a long time and had been practicing their aim at a target range just days before their murder spree, the Federal Bureau of Investigation said Monday. “We believe that both subjects were radicalized and for quite some time,” said David Bowdich, the F.B.I. assistant director in charge at a news conference. I guess you could surmise from this that what the FBI discovered is that Farook and Malik had been involved for a long period with advocates of jihadist murder who claimed to act on behalf of Islam. But then why not just say that? Does radicalization begin when Farook and Malik began contact with jihadists, or when they began espousing jihadist beliefs themselves? And how long is quite some time? The idea of radicalization is obviously germane to the discussion of how terrorist ideologies spread, but it’s not adding much value as it’s used here.